It all started back in 1992… I had been driving my Land Cruiser 40 series daily for 15 years but sadly it was starting to look pretty rough. Mechanically the truck was still sound, but the body was growing increasingly cancerous and it was clearly getting beyond restoration. Over the years I had done the traditional rust repairs in steel but it seemed all the hard work only lasted a few months before the rust resurfaced somewhere else. No matter how hard I tried, even full panel replacement in stainless steel didn’t work as eventually the remaining steel mounts gave up and the whole tub simply collapsed onto the frame. I needed a new body and one that would not corrode. Aluminum wasn’t the answer. It couldn’t be used with dissimilar metals unless you wanted to create a battery and it was extremely difficult to repair and even more difficult to work which precluded all the details like the louvers. What I needed and really wanted was a well built composite body… so I set to work to create my own custom composite tub. The hard part would be creating the tooling that would produce the parts with all the detail of the original truck. The strength and/or the weight or the parts would not be an issue, it was creating all those factory returns and all those details, such as the louvers, that made that made that Land Cruiser “look” that was so important. After 25 years, the parts and the processes have evolved but oddly we find that today we are back to building the parts more by hand than ever… fitting and assembling individual panels in much the same way the original truck was built. And while this all started for my own personal needs, the product line has expanded to include almost every part to built an entirely composite truck. Our finished product is almost indistinguishable from the real thing – except it is quieter, stronger and it will never corrode. Read More "About Gozzard Composites"
We built our Fiberglass Land Cruiser Parts using marine grade materials and processes. The materials used in the marine industry are stronger and last longer. They are also considerably more expensive than those use by industrial fiberglass shops. Quite frankly, the parts built by our competitors are simply not at the same level of quality or detail. And if they claim otherwise ask them to show you an example of something else they have built. We will show you a 56′ ocean going Motor Yacht and a 40 year old reputation in the marine industry. They might be able to show you a man hole cover or a water slide panel or worse, maybe nothing more than a land cruiser part! But what does this mean? We are not building sports car parts, these are replacement land cruiser parts and strength is the issue. We build our parts as close as we can to the original weight of the steel part – sometimes heavier. The critics will talk about Corvettes and trees and bolder… but try lifting your steel land cruiser by it’s rocker panel! These are not your average fiberglass parts. 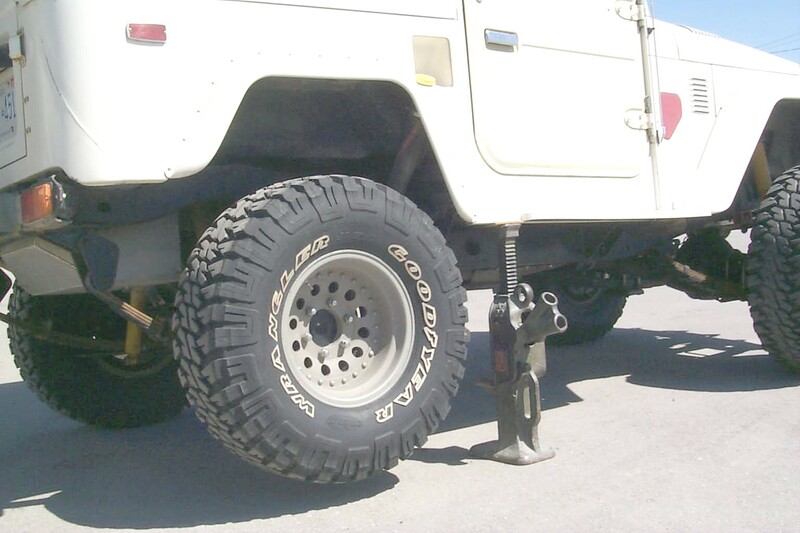 Our fiberglass land cruiser parts are built to be very tough and very durable. We build parts you can jump on. Quarter panels that will take an impact with a bolder. These parts were designed and intended for OFF ROAD USE. And although these parts might be suitable for other uses they are not designed, tested or approved for on road use. USE THESE PARTS AT YOUR OWN RISK. All our parts work in any combination of original steel parts. The original steel parts such as the hard top sides will fit properly and accurately on our a fiberglass tub and our fiberglass parts will fit on a steel truck in much the same way. And they look like the original parts. There has been no artistic licence taken, our fiberglass land cruiser parts look like the real thing and are virtually indistinguishable in terms of appearance and feel. We also have a complete product line. The entire truck is available fully in composites. Our parts easily accept paint finishes including Line X. And despite what you may have heard, fiberglass is much easier to repair than steel and a lot easier to repair than aluminum. We work with all these materials in our boat business and we work with Stainless Steel and Aluminum on daily basis- we would not claim it is easier to repair unless we knew first hand and we do. And these fiberglass parts will doesn’t corrode. Finally, what really sets our fiberglass land cruiser parts above those from other manufacturers is our attention to all the little details. Things like all the factory returns on the hood, the wheel wells and fenders. Louvers that look like the original and the details of the rail gutters are thing you will not find on other aftermarket parts. We do not just mold parts, we use the molded parts to create larger assemblies in much the same manner as the real thing. And we continue to strive to build the best looking parts available. Today we assemble all body panels by hand to ensure all the panels are straight and true. Our goal is to produce the best fiberglass land cruiser parts available – second to none. GOZZARD COMPOSITES is a division of GOZZARD YACHTS Ltd, a world renowned luxury yacht manufacturer. Owned and operated by the Mike Gozzard, we are located in Canada’s prettiest town on the shores of Lake Huron. Our facilities are located in the industrial park just south of Goderich on Hwy 21. A quick visit to our yacht building web site (www.gozzard.com) will reveal our background. As you can see, we are very capable in the fields of design, construction and engineering of complex fiberglass parts. Our yachts are considered ocean going and have a reputation of being extremely robust. Our composite land cruiser parts are built with the same goals in mind. Working in the marine industry with composites (fiberglass), aluminum and stainless steel every day give us a unique and unparalleled perspective on what materials are capable of and how best to use them. Honestly, if we thought another material could build a better part, we would be using it, Given what we do and how long we have been doing it for, it is easy to suggest we speak from experience. Our fiberglass Land Cruiser parts are manufactured using the same techniques, processes and materials as we use in our large yachts and they are built to marine quality standards. It means our parts are built to last and they are built not to corrode. We share the same passion for the Land Cruiser as you do and we have been building replacement fiberglass parts for the Land Cruiser almost 30 years. More than long enough to know what works and what does not. We invite you to have a look and discover the difference for yourself.